Of course, tapping at a phone screen is nothing like shooting a real bow, so app developers must come up with interesting ways to let you draw and aim at virtual targets. Some developers have done it better than others. Thanks to the developer team TofuStudios, we now have a real combination of cuteness and shooting, a game that can be played by both children and adults. 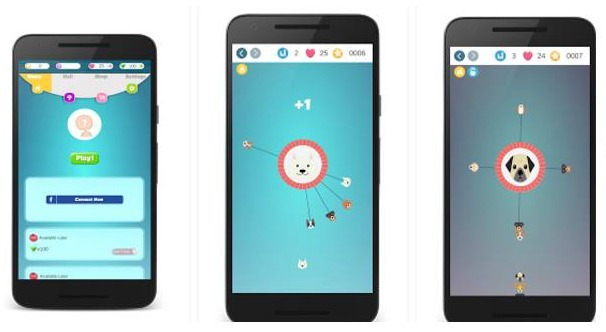 The game is called Pin the Pup, designed with lovely graphics and compatible with both Android phones and tablets. Pin the Pup is one of those games that are simple to play, but hard to master. Download it and start shooting, you will quickly get addicted and glued to your device. The main goal of the game is to pin the arrows with puppy faces onto the center circle. Show your agility skills, prepare your finger-to-eye coordination and shoot in order to pin the puppy arrows to the wheel that never stops spinning. You will be able to play through 1000 challenging levels and more, to make high scores and win amazing rewards such as diamonds. Play one of the most entertaining games on the Android platform and share it with your friends and family via Facebook. Download Pin the Pup by clicking the Google Play link below, it is completely free of charge!